Making a comeback is nothing new in motorsports. Face it, this is a very dangerous sport that can leave drivers temporarily or permanently injured, with anything from bruised knees to broken bones to far worse things. Drivers sometimes come back the next week, the next year, or not at all. Sometimes after injuries, drivers come back to the sport. Sometimes, they do not. For Florida Super Late Model veteran David Rogers, that answer was easy for him, but not everyone around him. Rogers will be the first to tell you that he’s been in his fair share of accidents during his career, like any races. He’s hit walls at New Smyrna Speedway, hit other cars at Lakeland and even flipped a car at Talladega Superspeedway. But in October of 2004, at 49-years-old, Rogers hit the wall at Orlando Speedworld... and things were different. “It was just a regular weekly show at Orlando,” Rogers begins, telling the story of that fateful night. “I hadn’t raced in about six weeks because of all the storms. I was just ‘jonesing’ to go racing really bad. We went out there on a Thursday night. The track was actually kind of wet. It had water seeping out of it places. We started the race and I was on the outside pole. “I really don’t know much about the accident other than what people told me. I don’t remember the race at all. On the second lap of the race, there was a car on the inside of me. The car on the inside and I bumped a little bit which probably got me into the wetter stuff along the top of the track and I got into the wall. The car was loose when I got to the corner. The car on the inside of me touched again and when we did, the car just snapped around. With the track being wet, it didn’t really slow down at all. The car just snapped around and hit the wall flat on the driver’s side. “It hit so flat on the left side that it didn’t even bend either bumper on the car. The guess the car just hit and stopped. These cars, built how they are with all the left side weight, are built strong. So that is probably the worst type of impact you can have. There is nothing to dissipate the energy. You just hit and stop. That is what it did. So maybe to the crowd of onlookers and even those racers racing against Rogers that night, the accident looked like nothing more than one of those typical “racing deals.” Little did many of them know that instead of being bummed out that they wouldn’t get to see Rogers run the rest of the night, there might suddenly be chances that Rogers may never race again. The side slap hit against the wall was one of those “freak deals.” It was the type of hit that happens a million times to one. But when it happens, people know it is bad. It is the same type of hit, that many people remember, knocked NASCAR Nextel Cup car Jerry Nadeau out of racing. Rogers’ injuries were numerous and severe. “My insides and body parts weren’t up to the task any more than my car was. Basically, it was an impact that forced all of my insides to have no where to go. I just hit and stopped. It was a freak deal. Instantly, getting Rogers out of the car, people knew that it was bad and that Rogers would have a long road ahead of him. “I remember being at the race track, but I don’ remember starting the race. It took them a while to get me out of the car. I was conscious, but not well enough. They were asking me how old I was and I was telling them I was old enough to buy beer. It took some time, but things slowly started progressing toward Rogers getting better. Being an old-school guy and a self-proclaimed stubborn guy, he wanted out of the hospital as soon as he could. One doctor said it would be bad to leave the hospital and one nurse was very mad that Rogers was ready to go home, but he needed a change of scenery. So Rogers checked out of the hospital and began to work on rehab, not just to get back into a race car, but to be able to function completely in everyday life for his wife and two-year-old daughter. “The morning that I left, I went down that morning to have a CAT scan. The nurse said that it took about six people to get me out of bed. She wondered how I was going to get around at home. I was just happy to get to go home, I didn’t care about my injuries. As Rogers said, it was a slow process of getting better. Even he didn’t realize how bad things were. “At home, I was taking these pills. I had a recliner on my couch. I pretty much sat there and slept there and did everything there for about a week and a half. My wife told someone the other day that it was like having two two-year-olds at home, me and my daughter. She had to give me a bath and dress me and everything. Then came something that scared Rogers more than anything before or after the accident. 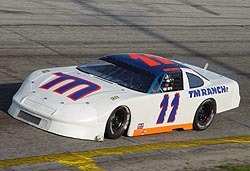 David Rogers' #11 is one of the most popular race cars in Florida. After repeated trips to the head trauma doctor, Rogers found out what was happening to him. It was the medication he was on. Then came the long process of healing and rehabbing. The doctors told Rogers that he’d make a full recovery from his injuries, but that it might take some time to get back into his normal life and routine, including racing. The healing and rehab process was long and hard and would take its toll on David and his wife Melanie and daughter Johnna. But the payoff would be sweet. “I knew I wanted to come back and race. There was a time where I was hurting so bad, in my head I would wonder if it was worth it. I have a two-year-old little girl. I know I am taking a chance every time I go out there on the track. But I’m not giving up on her and not giving up on my family. I know that that was my biggest concern. Racing is one of those inherently dangerous things. Its long been taught that “speed kills.” That was ingrained into our minds as kids growing up in driver’s education. So what does that mean for a sport where drivers sometimes race in excess of 190 mph? Well, you take a guess. But racing isn’t only dangerous because of speed. In fact, speed and injuries in racing are rarely linked. Most of the time, some of the most severe injuries are not a result of high speeds, but freak circumstances. And that is when a driver’s physical and mental toughness is put to the test. “I remember my wife being there and one of my crew guys being there. But I just remember them by the flash of the face and not actually what they were saying to me and what they were doing to me. “The first hospital they took me to didn’t have a head trauma doctor on call, so they loaded me up and took me to another hospital. I don’t’ remember any of that. When they took me to the other hospital, they took tons of x-rays and CAT scans. I don’t remember any of that stuff. David and wife Melanie and daughter Johnna. So the plan was set. Rogers would try and make his return to the car during Speedweeks at New Smyrna Speedway, a grueling nine-nights of racing that tests even the best of man and machine that are at 100-percent. Rogers had no idea if he was 100-percent. “I would say that I was worried about getting back in the car. 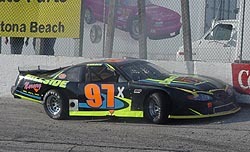 I think a good race car driver is when you are racing, you respect the wall and you respect the other racers around you. You just have to realize that it can happen the very next time you go racing. It can happen again. Just because I went 33 years without having any major, major injuries doesn’t mean it won’t happen the very next time I get in the car. I understand that. “I was really afraid that I would see the walls and not be able to react or that my reactions would be slow. The first night of Speedweeks, the team had some problems with the motor. They started 17th and finished 11th and got to pass some cars and miss some wrecks. The chance of getting injuried was always just a part of the game for Rogers. Rogers did make some changes once he decided that he’d be back in a race car. He started wearing a full-face helmet. He added some extra safety parts to his cars, including Randy Lajoie seats. He changed many other things. But the biggest thing he had to change was the thoughts of his wife. Then, the best therapy of all…. 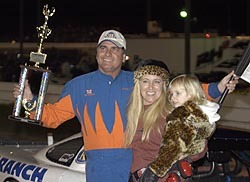 Rogers won the 30-lap Super Late Model feature on Sunday night, the third night of Speedweeks… just the third time he’d been back in his car since the terrible accident of just four months past. “Obviously, that is as good of therapy as you can have. It was so different than I expected it would be. Because, to be honest, it happened quicker than I thought it would. I wanted to come and be competitive at Speedweeks, but I knew I was jumping in a fire. 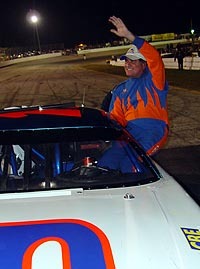 While Rogers didn’t win another race during Speedweeks, he did run every night and ran competitive every night. And he showed everyone that he was ready to be back in a race car. And he also showed the most important person to him that he was ready… his wife. “It has been hard on her. I know that. I’ve asked a lot of her. She was upset about the whole thing but she was really strong the whole time. She helped me to the utmost extreme to get through this deal. It completed a great comeback for Rogers and a great personal achievement. Rogers wasn’t the first and won’t be the last racecar driver to come back from serious injury. He’ll continue to race and continue to win. Years from now, people may forget what he fought through to get there. But he’ll always remember what he went through. And why. 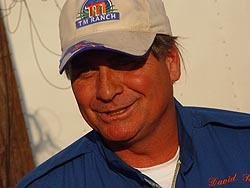 David's win at Speedweeks was popular among the fans, the team and his fellow drivers.